My submission is designed with the goal of being pragmatically simple, clear, and interactive in a way that aids both the doctor and the patient in keeping the patient healthy by identifying, solving, and mollifying problems. As a website that translate easily into a hardcopy, The Health Page is built as a tool that is useful both in the clinic, as well as for the patient at home. The top section of The Health Page is built as a compromise between giving the doctor what they need most quickly to help the patient as well as giving the patient the information most relevant to them. By including a very visible "plan of action" section as one of the first sections on the page, the doctor can provide the patient with information about what exactly they need to do to maintain their health. In the printed form, this plan of action will be more extensive, including discharge instructions highlighting what the patient must do most immediately. On the website, each entry in the plan of action will be linked to a description of the problem it is addressing. The design of the The Health Page leans on the data visualization principle of providing an overview with the ability to interactively dive in for more details. This is exemplified by the ubiquitous search boxes and filters, as well as the ability to rearrange and expand the test results. In talking with a few doctors, one of the biggest problems they faced was finding the information pertinent to their specialty amidst the sometimes many pages of medical notes. Comprehensive search boxes, which take into account not just the exact keyword, but also related words (i.e. "ophthalmology" should also show everything that includes the word "eye"), and the ability to quickly update and remove keywords will really facilitate the doctor's investigation. 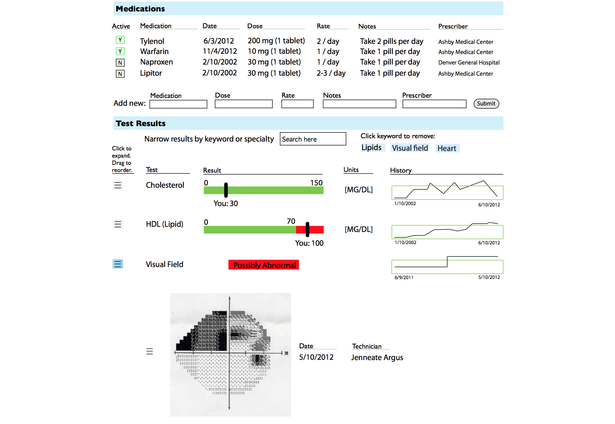 The results section is built to enable fast diagnosis, and in depth exploration. This is aided by the ability to rearrange and compare tests of completely different formats, including everything from blood tests to X-Ray images. Additionally, the use of small timelines in the results section allow the physician and patient to see how test results have changed over time, and whether the patient is making progress. In the hard copy version, the interactive search boxes will be removed, and all the information will be expanded and visible.